Hi Squash, Thanks to taking the time to answer a few questions. For anyone who doesn't who Squashmoen is, who are you and what's your main position in competitive play? Hey! I’m Squash! 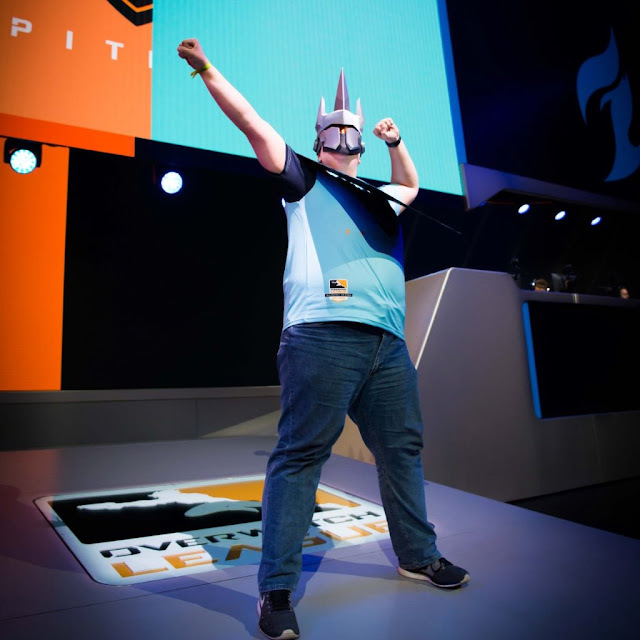 Most people know me as the loud and charismatic London spitfire fan that is frequently seen at the Overwatch league. I also play and stream Overwatch on Twitch. I am, what some may call, a main tank one trick! We all know that the Spitfire are the best team in the league to follow, but what made you put that sky blue jersey on and become a fan? For me, choosing an Overwatch league team was a tricky decision. I have lived the majority of my life in southern Wisconsin (the heart of the United States), and we were not fortunate enough to have an Overwatch league team based in the Midwest. So for me, I literally just got to choose! The day that I went to the Overwatch league for the first time, I ended up choosing the Spitfire. A partial reason for this choice was my love of history, And I respect what the Spitfire aircraft did to help the allies win World War II. The other portion of my decision is that my favourite ice cream flavor, Blue moon, is the exact same colour as the Jersey! That made it a pretty simple choice to choose the London spitfire as my team! You've become known as the Spitfires hype man. What made you want to take up that role? I never planned to become the Spitfire hype man. My friends who made me a sign to wear at the Overwatch league were egging me on to get the sign on the stream. Through a combination of factors such as sitting in the right spot, somehow convincing everybody else to put their signs down, and harnessing the excitement of the arena, I was able to ham it up on the stream. Getting recognised as the official hype guy by the team, and more importantly, the fans, happened naturally as I continued to go to OWL. What's been your favourite moments about attending the games week in, week out. As unbelievably cheesy as it sounds, my favourite part about attending the Overwatch league every week was meeting all of the amazing fans at the arena. I have never been in such an open, exciting, and all-around special place in my entire life. Even though I have now moved back to my home state of Wisconsin, I continue to have great relationships with many of the individuals who I met at the games. If you had to pick a favourite player, which one of the Spitfire would that be? Now, I know I may be a bit partial towards fellow tank players, but my favourite player on the London spitfire is Gesture. Not only do I look up to him as a fellow tank player, But I also admire him outside of the game. If you watch closely, it is almost always him who leads the team to stand up to shake the oppositions hands after a match. He is a natural born leader, and an extremely positive role model within the league. That, and, whenever he would be on stage, he would wink and waved to me. Although I only personally met him once or twice, I consider him a friend. As fans we've experienced a tough stage, how do you think stage four and the season playoffs will go? Stage III was a tough time to be a Spitfire fan. It’s always hard watching a team that performed extremely well in the first half of the season struggle with new metas, and ever improving opposition. Now, as we are almost halfway through stage four, we are starting to shape up. There have been a lot of changes made to the team, primarily benching HaGoPeun, TiZi, WooHyaL, and Hooreg, but it is important to remember that this is for the best interests for the team. I personally agree with the decision to focus on a smaller “core” roster. In the long run, I believe this will significantly help the team improve. Hopefully, this works out so I can cheer on the team in New York City this July at the Grand Finals! If someone else wanted to follow you and go to LA and watch the games. What advise would you give to them? My biggest piece of advice if you are making the pilgrimage to the Overwatch league, is to make new friends! I went to the arena by myself every single weekend when I lived in California, as i didn’t know anyone in the entire state, and I still had a great time. There’s no such thing as a stranger when you go to OWL, there’s just friends you haven’t met yet. Finally, You've obviously been able to attend a lot of games this season what was your favourite game to watch live and why? My favourite experience at the Overwatch league was the stage three finals. Spitfire unfortunately hadn’t made it into the finals, but it was my last chance to go to the blizzard arena before moving back to Wisconsin. While waiting in line to get inside, I was welcomed with open arms by both the gladiators and valiant fans to cheer alongside them in their respective matches. In no other sport would opposing teams essentially invite the “mascot” of a rival team to join their ranks. That day, I learned truly how amazing our community can be. I screamed “Shields up, Wings out, Rise up, and Sit down” and in true OWL fashion “Shanghai!” until I didn’t have a voice left. I want to say thank you to Squash for taking the time to answer a few questions for me, you can see his first appearance here, follow him on Twitch and Twitter to follow more of this antics and podcasts. The Spitfire return themselves for the final week in an attempt to solidify their playoff spot and go 5-5 for the stage with games against the Florida Mayhem and Philadelphia Fusion.